Background: Smith is part of pipeline of Ohio State players to the New Orleans Saints. A first round pick (18th overall) of the Saints in 2004, Smith was worth the investment. He performed a consistently good level in his nine years on the field, solid against the run and pass. He was good immediately, recording 30 tackles and 7.5 sacks in his rookie season. In the midst of the very difficult Hurricane Katrina season, Smith improved in 2005 with 40 tackles and 8.5 sacks. 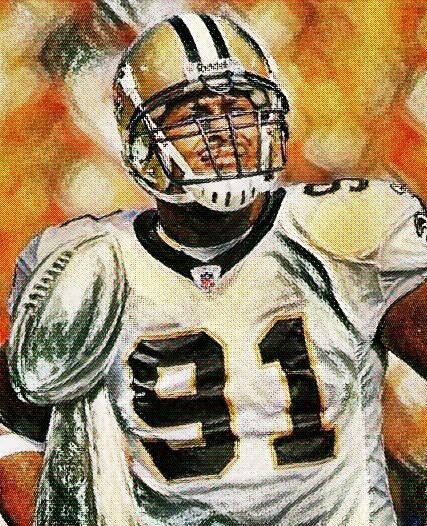 In his first year as a full-time starter in 2006, Smith proved himself to be among the league's best at defensive end, recording 10.5 sacks, recording 49 tackles, forcing three fumbles and recovering a fumble as the Saints reached the NFC Championship game and Smith earned Pro Bowl honors. 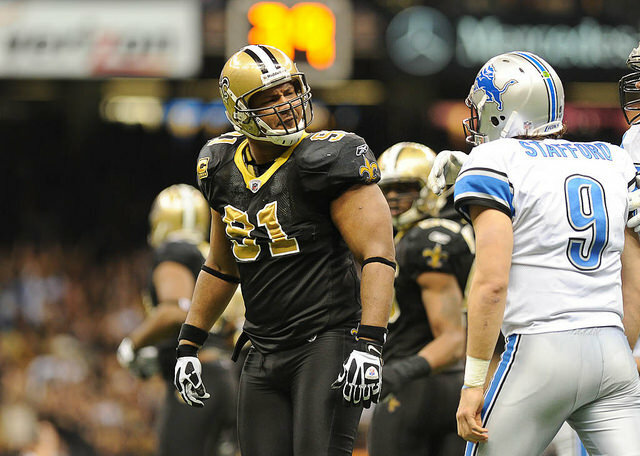 After a solid 2007, Smith slumped to just three sacks in 2008 but he and the Saints came back with a resounding roar in 2009. Smith was a terror, recording 13.5 sacks (fifth in the NFL), 49 tackles and forcing three fumbles and the Saints were a terror, emerging as Super Bowl champion. How Smith was not named to the Pro Bowl is a mystery as it was his best season, on the best team in the NFL. A solid, consistent player through 2012 as part of two more playoff teams, Smith was a consummate team player and leader, evidenced by his willingness to move to outside linebacker in new defensive coordinator Rob Ryan's new scheme in 2013 but he suffered a torn ACL in the third preseason game, ending his season and, as it turned out, his fine career. Smith led the Saints in sacks in four different seasons. He ranks fourth all-time in sacks in franchise history with 67.5 and 17th in games played with 139. Greatest Moment: When examining Smith's body of work, he was as consistent as any player you can find. His career was not about eye-popping individual games and statistics but he did have big games. On Sept. 27, 2009, the Saints at 2-0 were trying to prove that they belonged among the elite teams in the league. At Ralph Wilson Stadium in Buffalo, the Saints were clinging to a 10-7 lead with 2:20 to play in the third quarter. The Bills were at the New Orleans 27-yard line, playing a third-and-three, certainly in field goal range to tie the game. Trent Edwards targeted Terrell Owens. Jabari Greer got a hand on the ball, popping it in the air and Smith alertly peeled back from his pass rush and came up with a huge interception. The Saints went on score 17 unanswered points in the fourth quarter to win 27-7, spurring the team to a 13-0 start en route to winning Super Bowl XLIV. Smith had the interception, a sack and five tackles in the game. Honors: Smith was inducted into the Saints Hall of Fame posthumously on Oct. 28. He was a Pro Bowl selection in 2006 and honorable mention All-Pro in 2009.